We all experience varying levels of anxiety throughout our lives. A new job, the birth of a child, or stressful relationships can cause brief periods of worry and anxiety that affect our overall quality of life. Anxiety can actually have many positive effects—if it doesn’t get out of control. A healthy amount of anxiety can push us out of our comfort zone, enhance performance, and give us a boost of energy when we need it the most. Normal anxiety can also act as a protective mechanism and prevent us from getting hurt. Anxiety about spiders or strangers may keep us from getting a deadly bite or getting mugged in a dark alley. As an ordinary response to life experiences, anxiety can be a useful ally. However, it can easily spiral out of control and have a negative impact on our well-being. Worrying about an upcoming situation or event is something we’ve all experienced. A big test, job interview, high school reunion, or presentation at work can easily send the most well-adjusted individual into a tailspin of ‘what-ifs’. Negative news is also a common cause of anxiety. Diagnosis of an illness, a death in the family, a job loss, or a phone call from a school principal are likely to cause anxiety in anyone whose life is affected by the news. 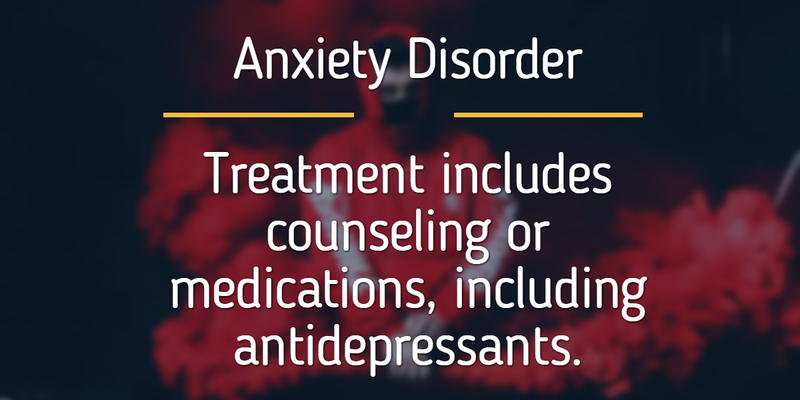 However, those who experience anxiety in a normal fashion find a way to cope with the situation or news in a way that does not interfere with their daily lives. Once the event has passed or the news has settled in, the anxiety fades along with it. Those who experience GAD have a difficult time relaxing or spending time enjoying hobbies or alone time. Distractions such as work or taking care of a family may ease intrusive thoughts for a period of time, but any relaxation time is interrupted by worry and negative thoughts. We all have unwanted thoughts every now and then, but those with GAD often have thoughts they view as uncontrollable. These thoughts take over and the sufferer is unable to find ways to quiet them or think about other things. Many people with GAD feel their anxiety is triggered by certain situations or people. This may cause them to avoid going to social functions, seeing friends or family, or even leaving the house. Anxiety and depression are closely linked in those who avoid social interaction. Those with GAD have a pervasive pit in their stomach and feel like ‘the other shoe is about to drop’ even when there is no evidence to support it. They may wake in the middle of the night with a feeling of impending doom or be apprehensive about future negative events that may never take place. Stress and anxiety have very real physical effects on our bodies. The constant strain of uncontrollable worry often causes gastrointestinal problems such as diarrhea or IBS. Those with GAD may also have frequent aches and pains and tightness in their muscles. Learning how to quiet the mind and focus on breathing is often a powerful coping mechanism for those who experience an excess of anxiety. Meditation, yoga, and deep breathing exercises can help the sufferer deal with uncontrollable thoughts and relax their bodies and minds. Relaxation strategies are usually not enough on their own to help those suffering from GAD and are most often used in conjunction with another form of treatment. A counselor or therapist can assist an individual with GAD by helping them recognize thinking patterns that cause anxiety. They can then help the individual develop coping strategies that head off unwanted thoughts before they lead to the emotions that cause anxiety. They can also offer a trained opinion on reasons behind the irrational thoughts and help uncover past traumas that could lead to anxiety. In many cases, counseling and therapy are enough to help an individual on the path to recovery. Knowing you are not alone is an important part of any anxiety-related disorder. Support groups can be very helpful for GAD sufferers by giving them an opportunity to meet others who share their anxieties. They can share their stories with those who understand, learn from each other, and get the support they need to begin healing. Those with GAD sometimes feel more comfortable with an online support group rather than one that meets in person and can maintain their anonymity while getting valuable support. If counseling and relaxation strategies do not have the desired results, medication may be used to treat GAD. Though usually the last option, medication can have a big impact on obsessive thoughts and worry and lead to better sleep and management of symptoms. If the disorder is especially intense and the sufferer is unable to cope with work or family obligations, medication may be used at the beginning of treatment and gradually tapered off as other treatments start making a difference. Anxiety should never control your life. The above five symptoms are warning signs that your anxiety has gotten out of control. If you believe you are suffering from an anxiety disorder that is having a negative impact on your quality of life, you should know that you are not alone and that help is available at EZCare Clinic. If you’d like to talk to a professional about your anxiety.